Hard to categorize, easy to love, 79.5 has become one of New York City most beloved underground acts. With three lead vocalists, and a band that pulls influence from every corner of a record store, it’s no wonder they are already taking the scene by storm. They are an act that gets put on as an opener and shortly there after is asked by the venue to do a month long residency. That residency leads them to a full page write up in The New Yorker before they even have a single out. The long and short of it is that 79.5 wins over the listeners wherever they play with an infectious energy. Between the arrangements of bandleader Kate Mattison and the prowess of all the players, their sets run a gamut of energies and tempos, whether breaking it down to acapella, turning it up to disco, or mastering the middle, they run the groove, and the crowd follows suit. Take all of that and put it in the studio with Big Crown’s own Leon Michels on production duties and you get a record we can’t wait to put out in the world, a record on which every song was recorded live to tape in one take. “Terrorize My Heart”, a tune leaving no room for gray, finds the ladies of 79.5 walking the line between vulnerability and forthright- ness. Setting out with admonishments of love and infatuation that are checked by the bluntness of women who’ve lived in the Big Apple for years, “is it her or is it me, that’s how it’s gotta be”. A smashing rhythm section covered in punching rhodes chops and flute parts sets the perfect vibe for the ladies to trade off leads and come back together in three part harmonies: All the while taking the whole tune from half time to double time. 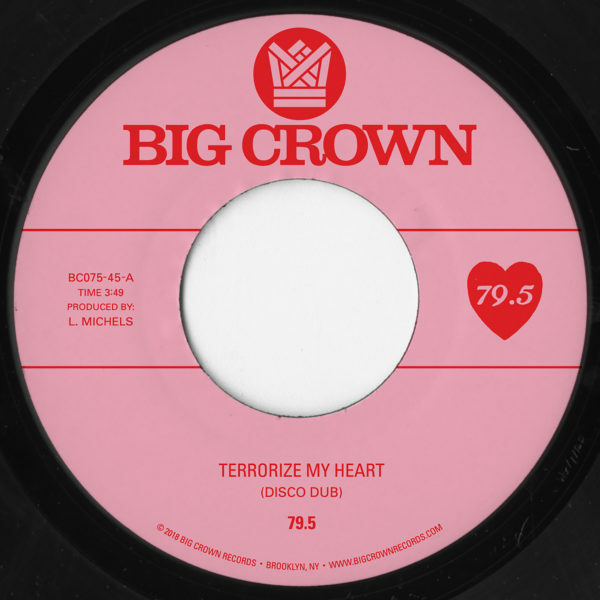 The Disco Dub mixed by Jens Jungkurth, finds Michels’ production taking “Terrorize My Heart” from the change where it goes to four on the floor and lacing it with drums and a clap track that absolutely pushes this tune over the edge into the realm of dancefloor banger.